Can the Hornets break through? Chris Musso returned to Locust Fork last year and the first-year head coach almost got the Hornets into the playoffs. A 31-24 shootout loss to St. Clair County in Week 9 ultimately proved to be the difference as the Hornets finished 6-4. The 6-4 season didn’t end in the most satisfying way but Hornet fans have to be pleased with the turnaround. Remember, this is a program that had gone 0-10, 1-9, and 3-7 over the three previous seasons and you have to go all the way back to 2002 to find a Locust Fork team that finished above .500. Oneonta was 14-1 and the Redskins are the defending state champion in Class 4A. Obviously they are the big dog until someone else knocks them off. The rest of the region has some work to do. Keep an eye on North Jackson. The Warriors were just 2-8 a year ago but Mark Rose has returned as head coach and he helped to build North Jackson into one of the most dominant teams in the state. From 2000 to 2008, he was 85-15 at North Jackson, including 13-8 in the playoffs. Expect North Jackson to be much improved…and quite possibly a legitimate region contender. Westminster Christian was 5-5 in Class 3A. Priceville was 4-6 in 4A. J.B. Pennington was 3-8 in 3A. All three can score points but all three must improve on defense to have a chance to make some noise this year. Locust Fork will open with a trip to Montevallo on Aug. 22 on a night when every other team in the county will play a jamboree. The Bulldogs are led by former Crimson Tide quarterback Andrew Zow. He is still trying to rebuild the Montevallo program as his team struggled to a 1-9 finish last year in 3A. 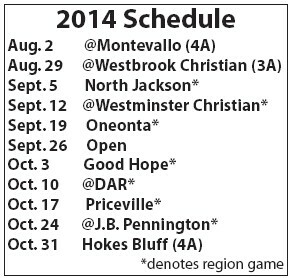 A trip to Gadsden to take on Westbrook Christian in Week 2 could be tough. The Warriors were a solid 2A program last year, finishing 5-5 and just missing the playoffs in a very competitive region. One thing Westbrook has had is consistency at the top. This will be head coach Tony Osborne’s 20th year as head coach and the Warriors have bumped up to Class 3A. Locust Fork’s opponents were a combined 48-60 a year ago. Oneonta was 14-1 but the rest of the teams on the schedule were just 34-59. It’s been awhile: Locust Fork and Hokes Bluff have met seven times over the years, the last time was in 2009. Hokes Bluff has won all seven games. Locust Fork and Good Hope have played 12 times and Good Hope leads the series, 8-4. The teams last met in 2003. Hello again: Locust Fork and J.B. Pennington have met 45 times and the Tigers lead the series 26-18-1. Locust Fork and Oneonta have met 53 times and the Redskins lead the series 45-8. The Redskins and Hornets have played each other every year since 1990 – and met twice in 2002. And your name is? : The new schedule means the Hornets will play Montevallo, Westbrook Christian, Westminster Christian, Priceville, DAR, and North Jackson for the first time.